A typical biopic generally will cover the life of the subject, or at least the most interesting parts of it. But Jackie, the new movie about Jacqueline Kennedy from Chilean director Pablo Larraín (No, Neruda), is anything but a typical biopic. Jackie concerns itself with only a few days in the life of Jackie Kennedy (Black Swan‘s Natalie Portman): from the assassination of her husband, President John F. Kennedy (Caspar Phillipson from Love and Other Catastrophes), to the funeral. The events of the film are told mostly as flashbacks, with Jackie alternating between confiding in a Priest (John Hurt from Tinker, Tailor, Soldier, Spy) and crafting her narrative to a Journalist (Spotlight‘s Billy Crudup). Through these unofficial therapeutic sessions, Jackie deals with living in the public eye in the aftermath of her husband’s death. While some might actually prefer a full-life biography of Jacqueline Kennedy, the concentrated timeframe of Jackie works quite nicely. 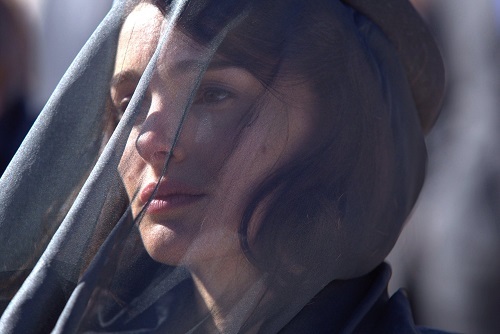 The movie is basically a snapshot of Jacqueline Kennedy in mourning. It’s a different kind of movie for screenwriter Noah Oppenheim (Allegiant, The Maze Runner), mostly talk and not a smidgen of action (except, of course, for the actual assassination scene, which is more powerful than the whole of Oliver Stone’s JFK). There is plenty of intrigue, however, as Jackie constructs different narratives depending upon her audience; her confessions to the Priest are much more honest and personal than the tales she feeds the Journalist, the Priest representing her private life while the Journalist settles for her public persona. What Jackie boils down to is a psychological portrait of a woman trying to keep it together while her world is falling apart. Larraín does a masterful job at letting the audience know when Jackie is being dishonest, both with others and herself, so the audience actually gets a clearer picture of the character than the character herself has. At times, she seems more concerned with moving out of the White House than moving on with her life, but that’s something she would tell The Priest, and not the Journalist, and Larraín lets us know that. Jackie the movie is more brutally honest than Jackie the woman. Although there are a handful of other characters in the film, Jackie is a one-woman show, and Natalie Portman gives a great performance. Her demeanor is mousey and soft-spoken, but she radiates courage and confidence. 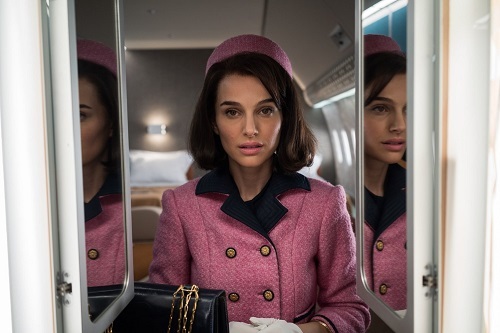 It’s the type of performance where Portman actually becomes Jackie Kennedy, filling out the hairstyle and costume with quiet dignity until the viewer almost forgets that they’re not watching a documentary. Portman immerses herself in the role, thus allowing the audience to immerse itself in the picture. The supporting cast is remarkable as well. In addition to John Hurt and Billy Crudup, the cast of Jackie includes Peter Sarsgaard (The Magnificent Seven) as John’s brother, Bobby Kennedy, and Greta Gerwig (Mistress America) as Jackie’s White House aide, Nancy Tuckerman. Jackie leans heavily on both Bobby and Nancy in her time of need, and both Sarsgaard and Gerwig stay strong for her in their roles. Of course, Jackie is in no way an ensemble picture – it’s Portman’s movie, and it will remain so come Oscar time – but the supporting cast supports her well. Jackie was shot by cinematographer Stéphane Fontaine (Elle, Captain Fantastic) in a way that is almost Terrence Malickian (Malickesque? ), utilizing long surreal takes with slightly moving, always fluid camera work. There is a vintage look to the picture, and not just in the doctored news footage segments; the whole film just oozes sixties nostalgia, thanks in big part to the neutral pastel color palette and grainy film photography. Fontaine also alternates between wide, actor-losing views and tight, claustrophobic peeks, illustrating how Jackie is under the microscope, even in a world that is so much bigger to her without her husband in it. There’s nothing flashy in the cinematography for Jackie – it’s just shot with a style that is subliminally confining. It’s a great looking movie. The musical score to Jackie is one of the strongest aspects of the film. Composed by Mica Levi (Under the Skin), the score borders on the traditional, with touches of grand patriotism and all-American pride that will suddenly turn dark with dissonant pianos and military-style drums. It’s unsettling, but it’s an unsettling movie, and that’s exactly the score that it needs. Of course, Jackie tosses on the soundtrack to Camelot a few times, the words “in short there’s simply not a more congenial spot for happily-ever-aftering than here in Camelot” taking on a completely different meaning with Kennedy’s administration coming to its tragic end and Jackie realizing that she will not be part of the happily-ever-aftering any more. Whether it’s the hauntingly disturbing original score or the lifted-from-Broadway showtunes, the music in Jackie is an unforgettable part of the experience.